Every college student is faced with the challenge of being mindful of their surroundings in a fast-paced, high-sensory and often-emotional environment, and the threat of sexual violence is a concern. One attack is too many, and the national problem is far worse. According to statistics cited by President Obama at the rollout of the White House’s “It’s On Us” sexual assault prevention campaign in September, one in five women on U.S. college campuses are victims of sexual assault or attempted sexual assault. Visit the GCU It’s On Us web page to view a video, take the pledge and read tips on looking out for friends and taking action in difficult situations. 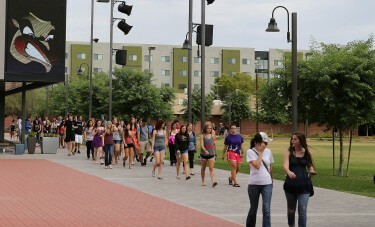 Anyone can make a report through the campus Public Safety office (also at 602-639-8100) or via GCU’s Title IX office. Liana Allen, ASGCU’s chief of staff, recalled learning the one-in-five statistic during a visit to another university in the fall after the Obama Administration had launched “It’s On Us.” When she returned to GCU, Allen set out to involve her peers and other University stakeholders — including Student Engagement Director Jeremy Mack, Pastor Dean of Students Tim Griffin and campus Public Safety staff — to create a similar campaign on the ground campus. Now it’s up to students to empower themselves and spread the prevention message as GCU continues to grow. While some students shared her passion for being part of a solution, others have been shocked by some of the statistics they’ve seen as ASGCU prepared for the public awareness event. 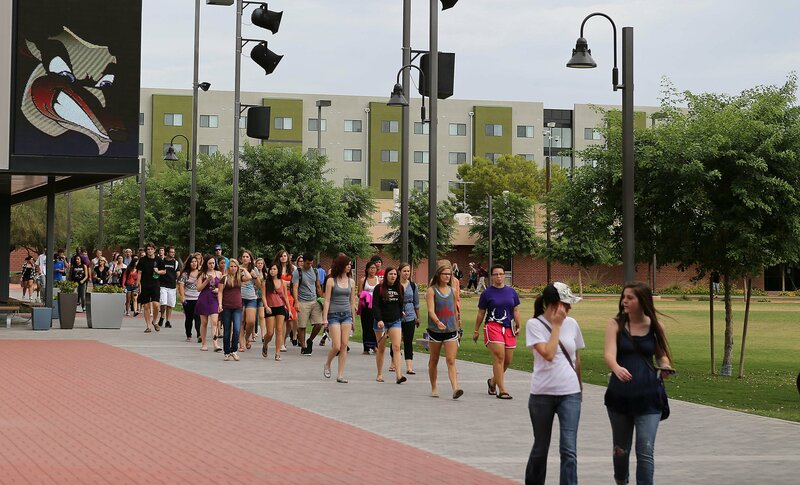 “Theoretically, if you know more than five women on campus, you might know someone who’s been sexually assaulted,” said Allen, who added that ASGCU plans to help drive discussion on the issue every school year in the future. Sexual assault is a widely underreported crime largely because many victims blame themselves or are too emotionally overwhelmed to take an accusation to police. Other reports are subject to misinformation as acquaintances accuse each other of varying degrees of consensual or non-consensual actions. If an accusation of sexual assault is made, Public Safety works with local police and other campus departments to address the victim’s needs. The law enforcement process would include sending the victim to the Phoenix Police Family Advocacy Center, which primarily supports victims of sexual assault and domestic violence. Added security on campus also has helped Public Safety maintain overall a more safe campus environment. “Our procedures for Housing and Public Safety help it from happening as widespread as it is on some other larger campuses,” Laird said. He added that each of GCU’s reported sexual assaults in the past few years — like the majority of cases nationwide — has involved a student, friend or acquaintances, rather than a stranger targeting or attacking random students. Oftentimes, the familiar nature of an attacker makes it more difficult for the victim to come forward or press charges. Some victims might also hesitate to follow their instincts at an off-campus party or event with other students or acquaintances. “If the hair is standing up on the back of your neck and you feel it’s a bad situation, then it’s a bad situation and you should get out of there,” Laird said. Griffin, who also serves as a GCU deputy Title IX coordinator, said the It’s On Us campaign made sense for the ground campus. He and other GCU officials meet weekly with Title IX representatives to ensure that reports of sexual assault are streamlined and that the University continues to educate the campus community about prevention measures. Griffin said sexual assault is an issue that GCU has “become more sensitive to.” He’s encouraged students, including those in campus leadership roles, to be open and honest in their discussions with their peers.